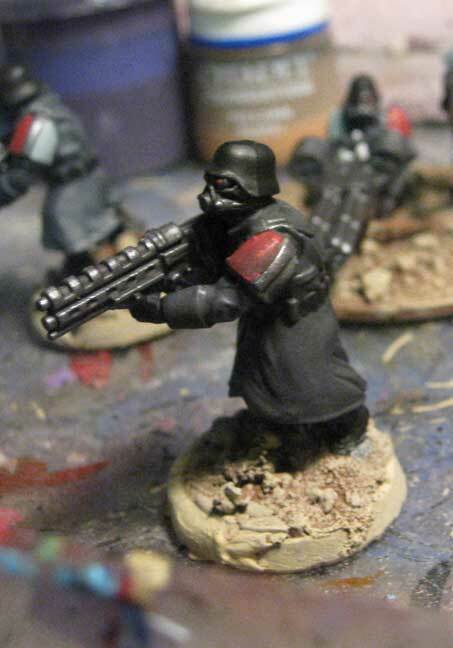 Warhammer 40K – My newest commission is a Imperial Guard force that I'll be painting squad by squad. My client opted to go with the more affordable Wargames Factory Shock Troopers the models are about the right scale and they have the look he wanted with out breaking the bank trying to build a Death Corps Forgeworld Army. He was little haphazard with the way he glued models to the bases he had so the scrolls don't always line up on the bottom of the base. He asked that I just try and hide it with paint. Easy enough, the models also have a plastic tab on their feet which he just glued to the base. Not exactly how I would go about it but every gamer has their own quirks and for some just getting something on the table that looks decent is more important than the little details. I hid the bases with some sand and rubble then set about priming the models. After a gray base I went in with foundation paint and picked out the black, red and white areas then added metallic to the guns and face masks. Doing these assembly line style I was able to get most of the work done in one night. Next steps are to wash them with black, do some minor highlights and apply the Helghast Decals to the shoulder pads.